In this world of ever increasing violence, a simple walk in the park can become an exercise in survival. You can be the victim of any number of frightening confrontations. The overburdened Police Force cannot come to our rescue every time before real damage has been done. Unfortunately, ordinary people who would normally never even consider getting into a fight in the street are too often the victim and left with broken bones and a tragic memory. You, the ordinary person, therefore, need a way to protect yourself and your loved ones. Shorin-Ryu is a complete form of self defense originating from Okinawa, Japan. Shorin-Ryu blends a unique balance of fighting with both hands and feet. It encompasses all aspects of the art including Kata, sparring, self defense and basic techniques. Shorin-Ryu provides much more than a means of self defense for a serious student - it provides a way of life. WHY DO YOU NEED KARATE TRAINING? WHAT CAN KARATE TRAINING DO FOR YOU? 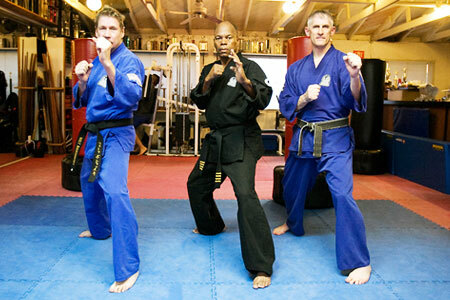 Shorin-ryu is a perfect choice for all round self defense and physical fitness. A person well trained in Shorin-Ryu will be able to protect themself against a single or multiple attack, whether the attacker has a weapon or not. Shorin-Ryu training can improve a person's speed, timing, coordination, balance, general awareness and strong confidence building. The Philosophy of Shorin-Ryu teaches courage, humility, kindness and respect for yourself and others. The exercise that you receive provides a splendid route for self improvement and overall body conditioning. "I promise to practice each and every time with all the desire and enthusiasm within me. I will become a member of the greatest fighting team in the nation. I will become a champion and will start now to train, think and act like a true champion."